I did a post recently on The Traditional British Sunday Lunch, which featured roast beef, Yorkshire pudding, crusty roasted potatoes and bread pudding. Even though I wrote as if I had a long experience with this classic meal, actually I had only helped a friend – and made notes – one time. However, my wife and I recently hosted a dinner party for 10 people featuring all of these dishes and it was a great success. So much so that I decided to spend more time on each one of the components. Let’s start with Yorkshire pudding. “Yorkies” only take about 25 minutes to bake. It is a great dish to put in the oven after your guests arrive and have a drink in their hands. Assuming your oven has a glass window, everyone will be able to see them puff up and maybe try a bite of one as soon as they come out. Yorkshire Pudding is a variety of popover, one of those marvelous creations that magically double or triple in size, with a golden brown, almost crunchy, exterior and a soft moist interior. If you have a good recipe like the one below and some luck, you can really wow the crowd. Why do popovers rise? Popovers are basically flour, eggs and milk. When we mix the milk and the flour, a chemical reaction takes place whereby one of the proteins in flour – gluten – reacts with the water in the milk to forms long interlocking, mesh-like molecular chains. The same thing occurs in bread-making where we knead the bread to facilitate this chemical reaction. 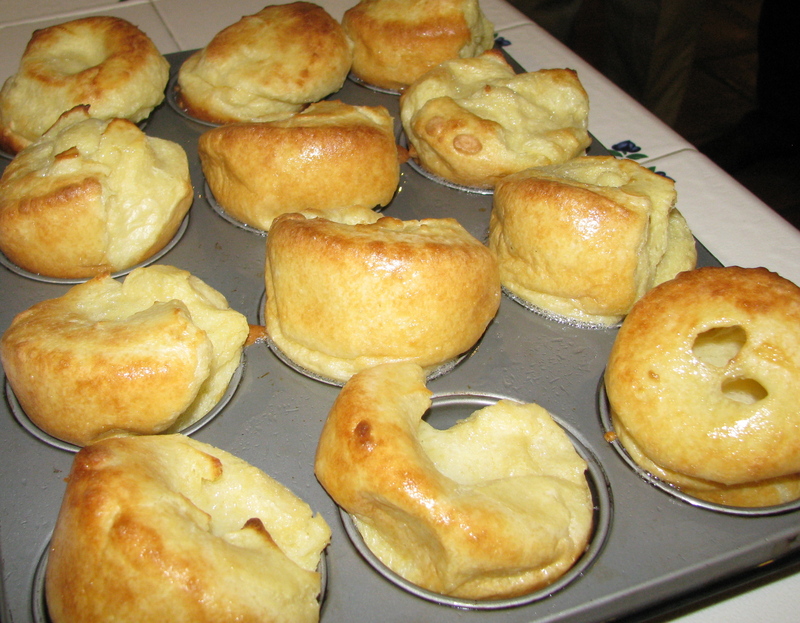 In the case of popovers, the batter has much more liquid and cannot be kneaded. Therefore, we stir vigorously with a whisk and then let stand at room temperature for a period of time – 15-30 minutes – so the molecular mesh of gluten can form. The protein in the eggs also reacts with the gluten and adds a “stretchiness” to the molecular framework. When the batter is poured into a hot muffin tin and put into a very hot oven, the water from the milk in the batter rapidly forms steam. The steam pushes against the stretchy molecular mesh in the batter, and the Yorkies rise. You need to have the oven hot enough so that the popovers rapidly bake while rising. Since the steam eventually escapes, you want the popover to bake quickly to give it some structure and rigidity to avoid rapid deflation. 2 cups all-purpose flour – don’t use bread flour since it has more gluten and may create a molecular mesh that is too strong and not easily inflated. Make sure the milk and eggs are room temperature. Mix the eggs, flour, salt and milk thoroughly with a whisk until frothy. This takes about 3 minutes. Let the batter sit for 30 minutes. Pre-heat the oven to 450 degrees and make sure the rack is in the lower one-third of the oven. We need room for the Yorkies to rise without getting into the hotter upper reaches of the oven where they might burn. Put one tsp. of oil in each muffin cup and put tin in oven for 5 minutes so that the oil heats fully. This will prevent sticking and insure a crispy bottom. Take hot muffin tin out of the oven and fill each cup 2/3 full with batter. Do not overfill. Remove very gently from the oven, let cool for 5 minutes and serve. Serve with other Bravado Cooking recipes like Veal Piccata or Steak au Poivre. Pour the sauce over the Yorkie. Or, serve with casserole dishes like Beef Bourguignon or Coq Au Vin. Make mini-Yorkie appetizers. You will need a mini-muffin pan, but they are easily available – about $10. Since the popovers generally end up with a hole in the top (where the steam finally escapes), you can fill these little beauties with things like pesto, crumbled blue or Feta cheese or pieces of smoked salmon, and serve on a tray accompanied by a crisp white wine. I have never tried this, but it has to work. Some of you should try and let me know. Serve for breakfast with marmelade or jam. If you search for a good recipe for breakfast popovers, you will basically find the same recipe as we have above. You should have a popover pan which is larger than the standard muffin pans – you can get one on Amazon for about $15.